An autumn surprise of the most stunning kind, perfect for birthday, wedding, Thanksgiving, or any occasion! 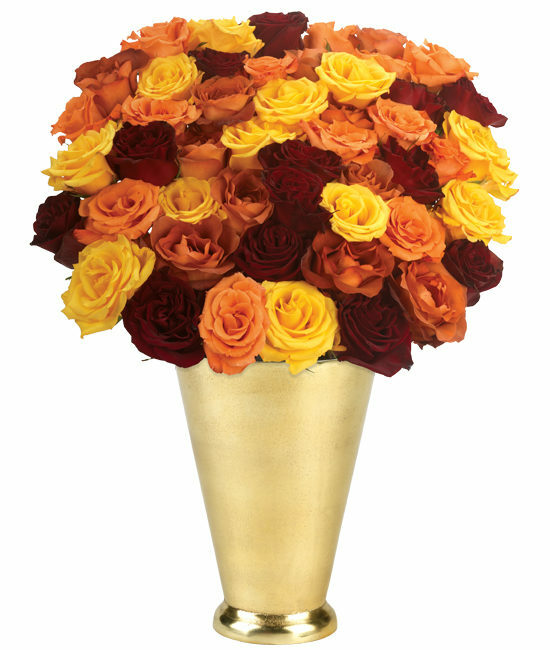 Fifty of our luxury roses in four of fall’s most striking shades arrive to fill the home or office of someone special in your life. We’ve displayed the luxurious combination of four different varieties (velvety Red Freedom, brilliant Orange Unique, High yellow, and terra cotta Cherry Brandy) in a magnificent gold plated case aluminum vase, sure to impress. Also available in 100 stems. Remove all foliage that will fall below the water line. Remove the “guard petal” on each rose – this is the outermost petal left on to protect the bud during shipment. You may also remove any petals that may have slightly bruised during shipping. We recommend cutting rose stems underwater for best blooming results. Add fresh water daily. Recut stems and change water every 2 to 3 days.